This blog is about recent adventures that I have been on and my stories and thoughts along the way. As we arrive at the Almaty train station (in the south east of Kazakhstan) our nerves were building and for good reason too. It was 5am and I could tell that both of us were having mixed feelings about what was about to happen. We both felt elated for finally carrying on our trip and leaving Almaty and heading to Moscow. There was no doubt an overwhelming concern too, knowing that we had to do more travelling on public transport with the bikes, yet again! We arrived in the station with 2 big green sacks with our dismantled bikes in, 2x 40l rucksacks, 2x full pannier bags, 2x white sacks with our wheels in and a few food bags. So it didn't surprise me in the least when the guard at the train door instantly said "no" and did a big cross signal with his arms. The guard was a large man with a podgy face. He wore a navy blue milatry style cap and suit with gold trim on the blazer and and a white ironed shirt underneath. He looked fairly tired which was understandable given the time in the morning that we were boarding. We proceeded to ask why and he simply pointed at all of our stuff and said "this" (pointing at our numerous small bags of luggage) ok "and this" (pointing at out two bikes wrapped up so beautifully in the big green sacks) "not ok!" Laura and I were both on the same wave length and said "ok, so how?" Waving our arms out by our side in our politest fashion. As if to ask is there a luggage carriage? But annoyingly the guard couldn't have been less helpful if he had tried. He simply shrugged his shoulders as if it was simply not possible. At this point I looked across to Laura and I could see that she was clearly not having a good time, I think the coughing illness she had been fighting with for over a week was taking its tole. She simply looked back at me with a tear rolling down her face. I think that deep down we both knew that we would be getting on this train with or without the bikes. We simply couldn't afford to let this train go without us. As this was happening another train guard had now popped out of the train and beckoned one of us to follow him. 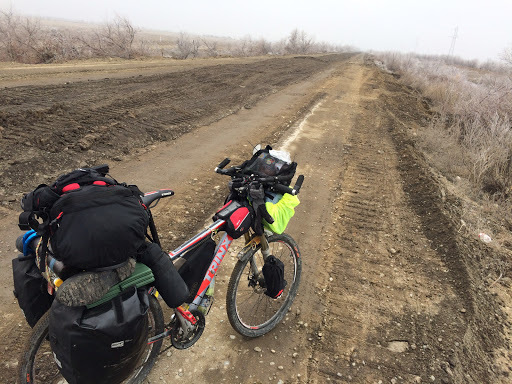 Our previous encounters of Kazakh tradition had shown us that when we met another man, whether a farmer or a local enquiring where we were going, they would always shake my hand (as the man) before acknowledging Laura. I simply guess that feminism and equality for women in this area is not quite at western standard just yet. So knowing that I was our best shot I went with him. As we walked down the platform I tried to explain that we had stared in china and that because we can only get a 30day visa in Russia we have to get a train I knew that he understood a little bit at least. The guard simply said "train president" and beckoned me in to a carriage . I followed the guard into a tiny office lined with laminated wood where I shook a short skinner mans hand who was sitting at a desk. he wore the same uniform as the rest of the guards but had a distinct 2 gold stars on his chest. He looked at me quite puzzled so I tried to explain our story about the bikes. As I did so I noticed a blank expression on his face. I stopped myself in mid-sentence and said "You speak English?" Pointing at him and, again, he looked at me with a blank face. The other guard now sitting down in the room said "No, does not" and I replied "oh" knowing my beautifully constructed sob story would get me nowhere this time. The guard then spoke to the "president" in Kazakh. We all left the dark room and walked back up to the carriage that we were trying to get on. As we got close I saw Laura sitting by the bags on the platform side with her head in her hands. I called out to her Laura, meet the president of the train" with my cockiest smile. Although yet again our cycling career seemed to hang by a thread, I could see something amusing in all the commotion. The guards chatted a bit then beckoned us into the carriage where he then pointed at our room and pointed "1,2,3,4" and then said "1,2" we then replied pointing at the top bed and jesting that the bikes could go there, knowing that if we could get the bikes on we would cram ourselves on one of the beds and bikes would fit on another. The guard could clearly see he was getting nowhere and we were determined to make it work what ever the cost. After this the guard pointed at me and took me into another small, dark room, leaving Laura outside again. As he shut the door behind him I automatically knew what was going on. I had previously had the same experience happen to me in Kyrgyzstan where in a rage of uncontrollable need to pee I had unknowingly urinated up against a police control post and had to play a 10,000 tenge (about 25 pound) bribe to get my passport back. So with the door now shut, the train guard drew with his finger on the side of his bed 100$ meaning US dollar. Luckily Laura had previously made me get $200 US in cash that she said was for 'emergencies'. I didn't understand at the time but now it made sense. I didn't argue even slightly.I said "yes" with a massive smile on my face, whipped out a crisp $100 dollar bill from my money belt and gave it to him. He then smiled back and opened the door. I hastily ran outside the train and with my loudest voice said to Laura "We're in!!" She replied "How?" I said "Bribe!" and she gave me a huge hug. With that we were away, bags, bikes and all... I hate to admit it but in that brief moment I felt like I had saved my damsel in distress and was so proud of myself for saving our trip!